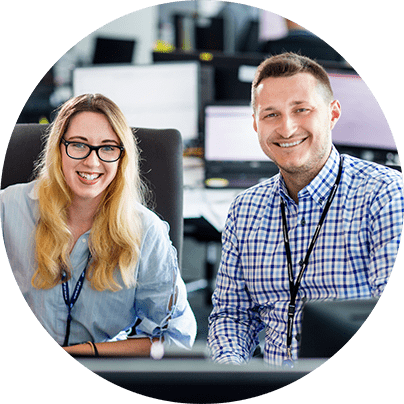 Sii Poland offers leasing of entire project teams with a dedicated Team Leader, who constitutes a contact point for our clients as well as monitors the performance of engineers and the output quality. Depending on the client's needs, the outsourced tasks can be executed on-site – at the Client’s premises, or off-site – at Sii Poland’s Delivery Centers. The clear advantage of cooperation in this model is not only responsibility transfer, but also the possibility to scale the team up or down as needed to apply the project’s changing needs. Thus, our team leasing services effectively address all the challenges of capacity and capability shortages. We give our clients an immediate access to the benefits of experienced specialists – to design and manage their own projects teams, as to the optimal team size and scope of work. With a database of 200,000 CVs, best-in-class toolsets and proven methodologies, we have the resources in place to initiate a new project quickly, ensure its on-time delivery and quickly execute the ramp down phase with the knowledge transfer from innovation team to operational one. Sii’s unappalled business potential and expertise stem from a full range of It and Engineering specialists whose technical and behavioral skills have been verified at the endorsement stage and now are continuously enhanced through trainings and workshops. Additionally, we have created a dedicated platform for sharing experiences and best practices to guarantee the most efficient Knowledge Management. Clients who decide to explore the potential of our IT and engineering specialists, experience cost savings that stem from slushing the direct and indirect costs without sacrificing quality of the entrusted processes. Additionally, the flexibility to reallocate and reduce resources allows our clients to convert the fixed costs into the dynamic ones, and as a result, increase budget efficiently. We deliver our services with a strict adherence to contractually defined tasks, scope and responsibilities. We offer our Clients a convenient communication and reporting system which allows the monitoring of the project execution progress in any place and at any time.